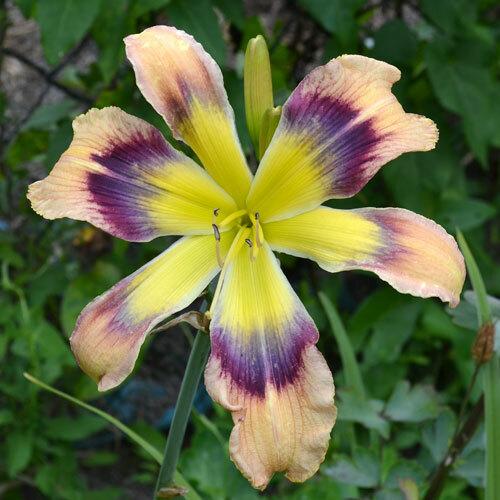 Height 36in (91cm), bloom 7.5in (19.0cm), season E, Rebloom, Semi-Evergreen, Tetraploid, 20 buds, 3 branches, Unusual Form Pinched Crispate, Yellow cream petals and sepals, fingered purple eye and edge, green throat. 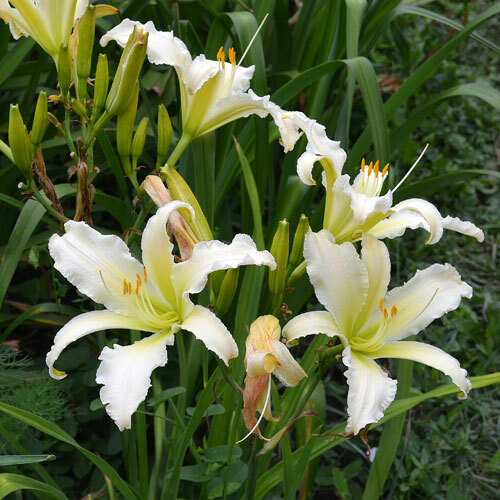 Height 30in (76cm), bloom 5in (12.5cm), season M, Dormant, Tetraploid, Fragrant, Cream self. 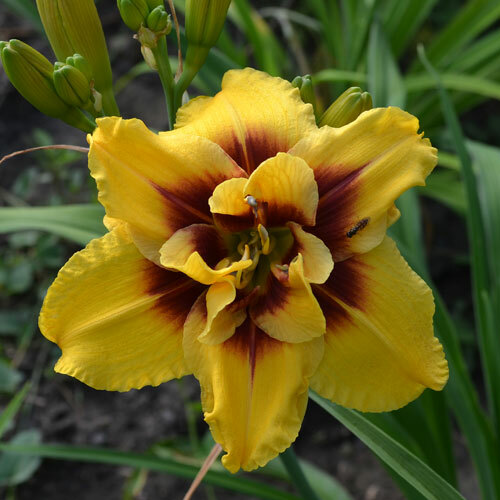 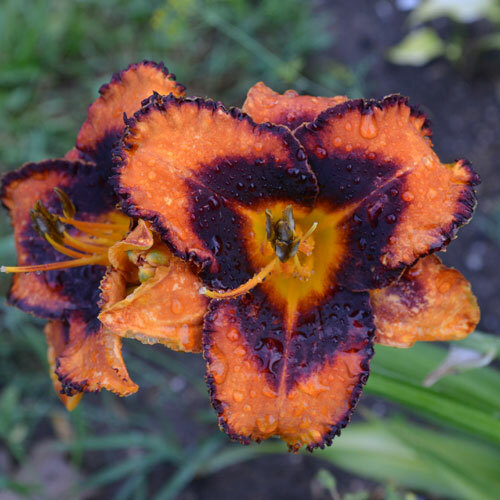 Height 34in (86cm), bloom 8.5in (21.5cm), season M, Rebloom, Semi-Evergreen, Tetraploid, 20 buds, 3 branches, Unusual Form Cascade, Light orange yellow with red purple eye above yellow throat. 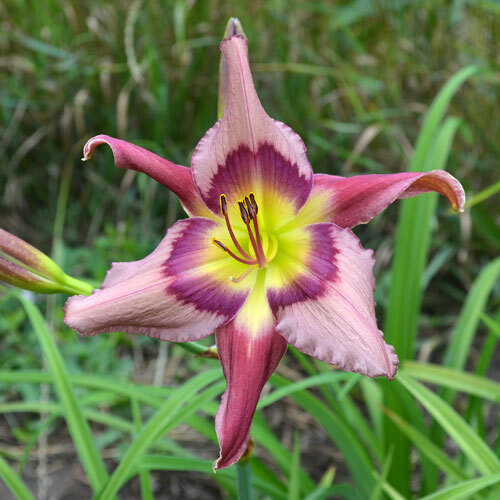 Height 40in (102cm), bloom 6in (15.0cm), season EM, Semi-Evergreen, Tetraploid, Sculpted Pleated, Cashmere lavender rose blend with pink watermark above green throat. 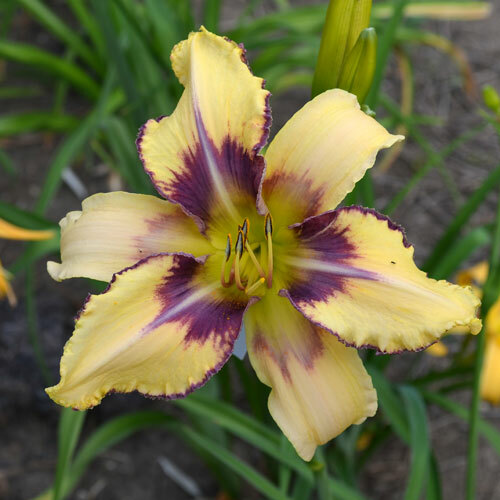 Height 27in (69cm), bloom 6in (15.0cm), season E, Rebloom, Semi-Evergreen, Tetraploid, 18 buds, 3 branches, Light cream petals and sepals, black purple eye and edge, green throat. 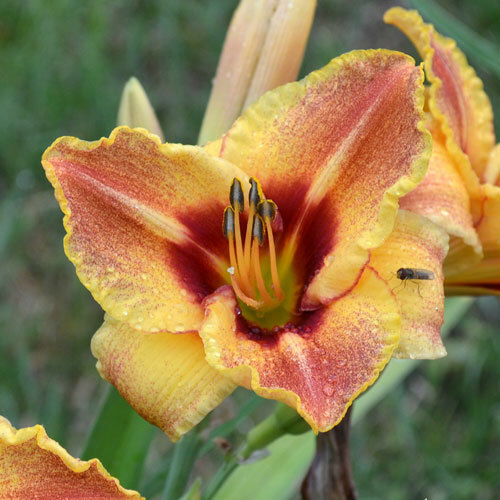 Height 29in (74cm), bloom 11in (28.0cm), season M, Rebloom, Dormant, Tetraploid, 20 buds, 2 branches, Unusual Form Crispate, Pink orange with red band above green throat. 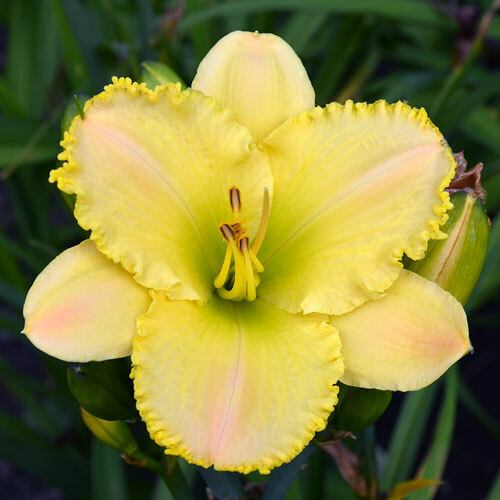 Height 36in (91cm), bloom 8in (20.5cm), season MLa, Rebloom, Dormant, Diploid, 27 buds, 5 branches, Unusual Form Crispate, White self above green yellow throat. 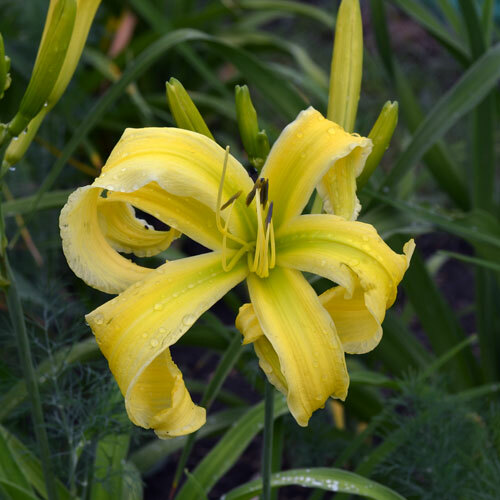 Height 39in (99cm), bloom 7in (18.0cm), season M, Semi-Evergreen, Diploid, Fragrant, 15 buds, 3 branches, Spider Ratio 4.00:1, Yellow green blend with white edge above green throat. 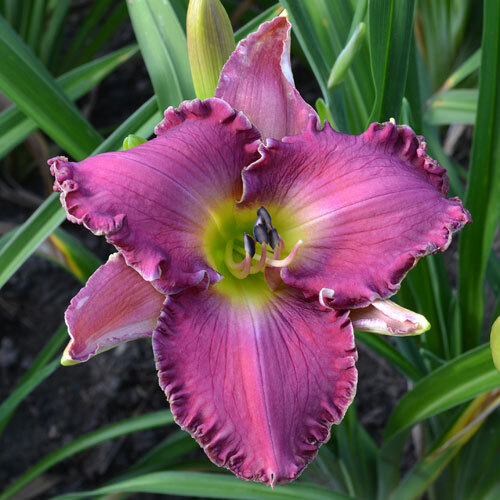 Height 27in (69cm), bloom 6in (15.0cm), season E, Rebloom, Evergreen, Diploid, Fragrant, 16 buds, 2 branches, Peach with purple eye above green throat. 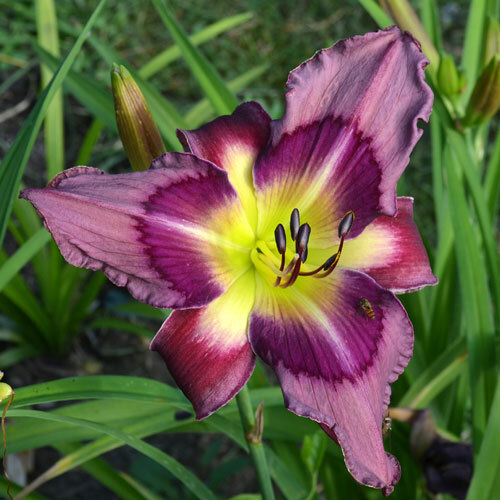 Height 30in (76cm), bloom 6in (15.0cm), season E, Rebloom, Evergreen, Diploid, 20 buds, 3 branches, Cream lavender petals and sepals, blue, purple and fuchsia eye, green throat. 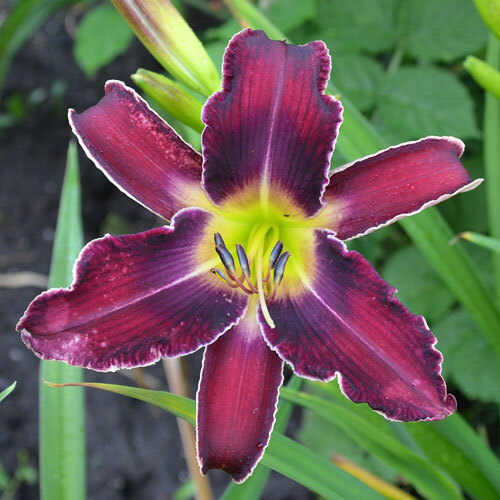 Height 43in (109cm), bloom 6in (15.0cm), season M, Semi-Evergreen, Tetraploid, 4 branches, Frosty raspberry with a violet triangular pattern watermark. 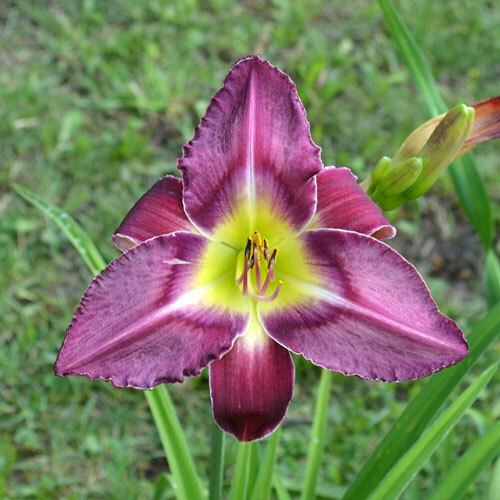 Height 27in (69cm), bloom 6in (15.0cm), season EM, Semi-Evergreen, Tetraploid, Fragrant, Lilac orchid blend with violet slate watermark above chartreuse throat. 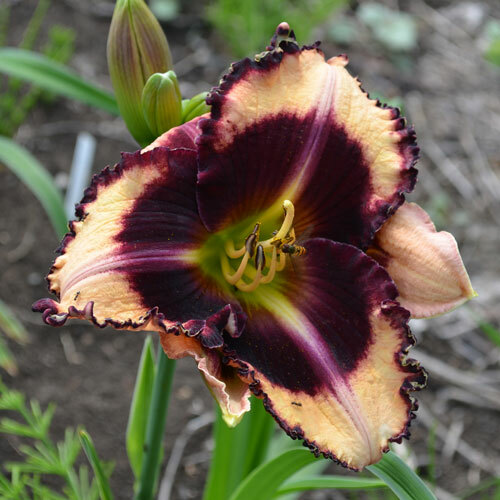 Height 41 in. 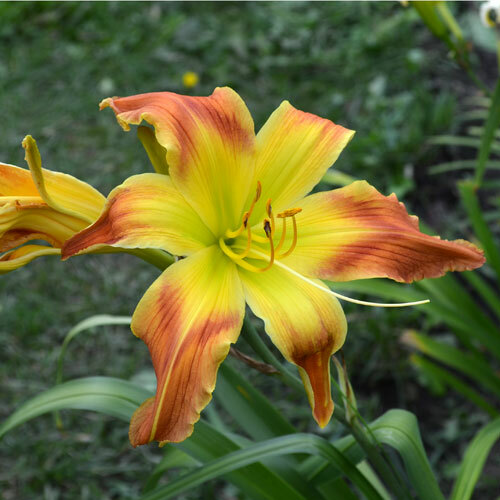 (104 cm), bloom 5.5 in. 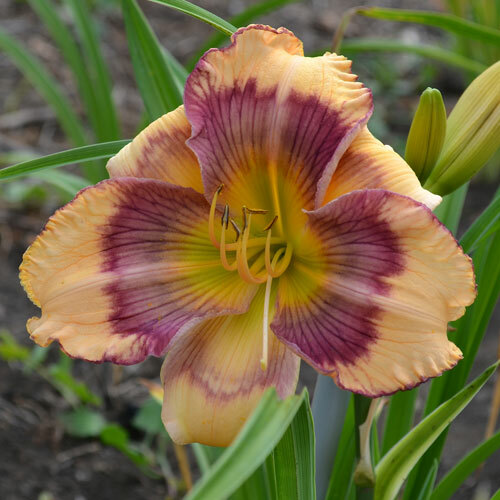 (14 cm), season MLa, Semi-Evergreen, Tetraploid, Orchid lavender blend with soft lilac watermark above chartreuse throat. 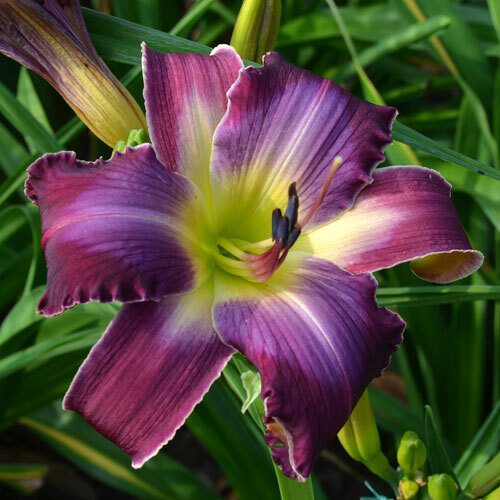 Height 28in (71cm), bloom 6in (15.0cm), season EM, Rebloom, Evergreen, Diploid, 18 buds, 3 branches, Mauve base with large purple eye and violet edge to the eye with cream sepals. 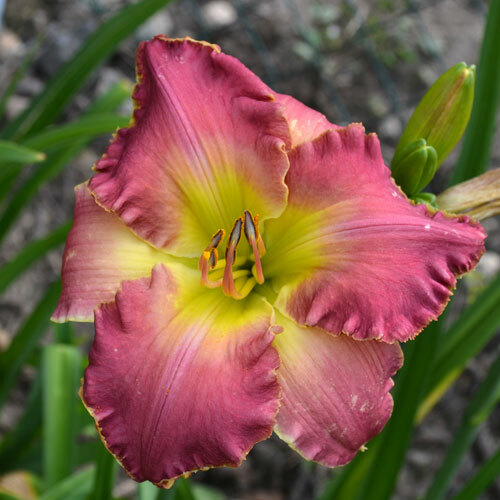 Height 25in (64cm), bloom 5.5in (14.0cm), season EM, Rebloom, Semi-Evergreen, Tetraploid, 22 buds, 3 branches, Pink with red eye and red gold edge above green throat. 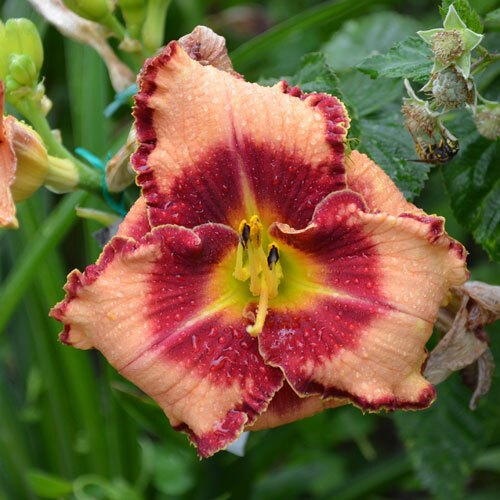 Height 22in (56cm), bloom 4.25in (10.8cm), season E, Rebloom, Evergreen, Diploid, 22 buds, 4 branches, Yellow overlayed with red dots and eye above small green throat. 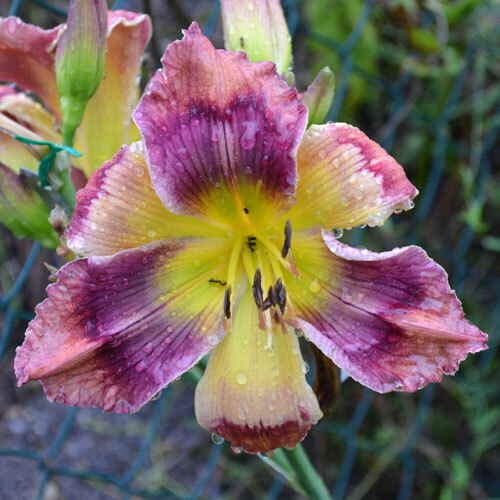 Height 26in (66cm), bloom 8in (20.5cm), season MLa, Dormant, Tetraploid, 12 buds, 3 branches, Unusual Form Spatulate, Purple grape with silver blue watermark above green throat. 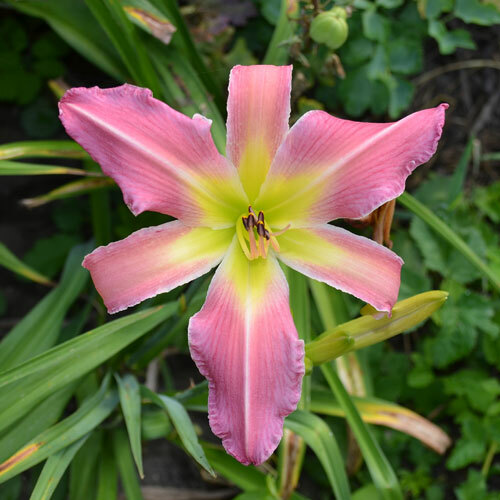 Height 43in (109cm), bloom 9in (23.0cm), season M, Rebloom, Dormant, Tetraploid, Fragrant, 22 buds, 4 branches, Huge hot pink self above green throat. 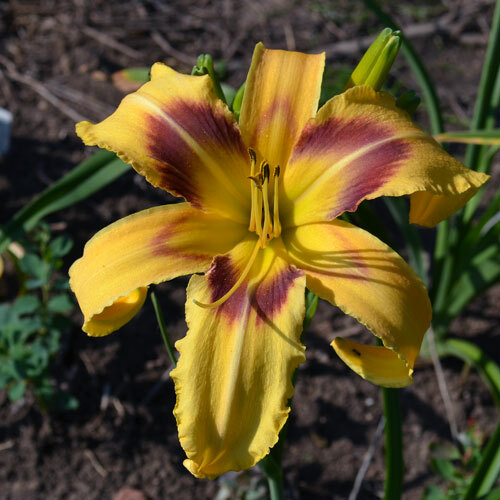 Height 20in (51cm), bloom 5.5in (14.0cm), season M, Dormant,, Double, Yellow with maroon eyezone.